To look back is a double-edged sword. To look back upon one’s achievements, mistakes and losses in order to grow as a person and to build a better future is important and valuable. Nevertheless, to look back longingly fetters an individual. 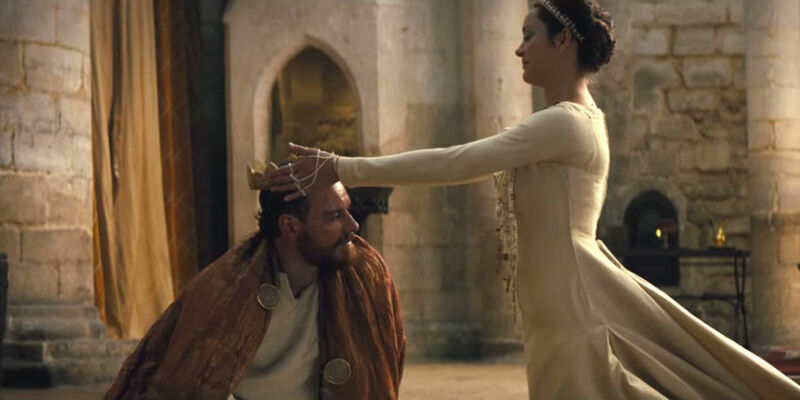 Justin Kurzel’s take on Macbeth illustrates how looking back longingly can manifest itself in a variety of negative ways on people and impair them. 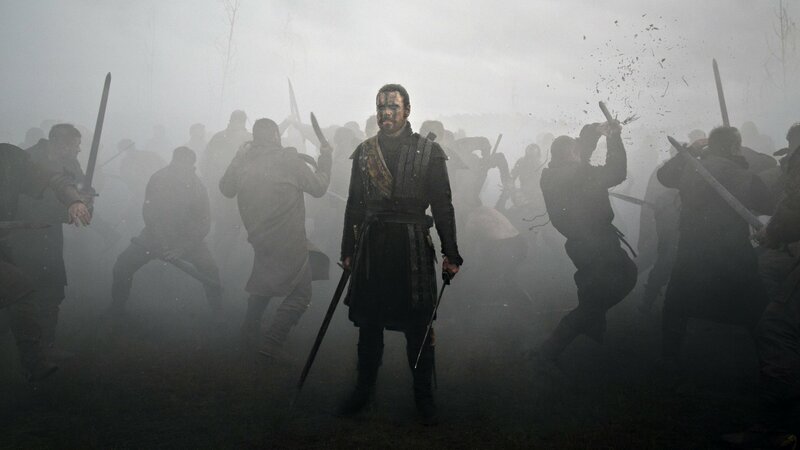 Macbeth (Michael Fassbender), bloody and filthy, in the heart of a (cloudy) battle in the Scottish Highlands. Kurzel’s Macbeth is based on the play, written by William Shakespeare. Macbeth, Thane of Cawdor (Michael Fassbender), receives a prophecy from three witches. They tell him that one day he will become King of Scotland and that no man of woman born will be able to kill him… although, they do warn him to be wary of Macduff (Sean Harris). Consumed by ambition and urged on by his manipulative wife, Lady Macbeth (Marion Cotillard), Macbeth acts to fulfil the prophecy. But at what cost? Macbeth is a compelling and gripping film. Central to this are the performances. David Thewlis as Duncan is decent, and Sean Harris as Macduff is very good as usual. Yet, it is the two main performers that stand out. 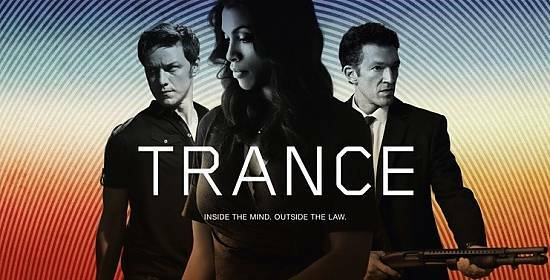 Both Michael Fassbender and Marion Cotillard are riveting. One may not always understand what they say since the movie is in Shakespearean English. But due to the strength and rawness of their performances, viewers can feel the emotion behind their words and, therefore, understand their actions. It helps that audiences can empathise with Macbeth and Lady Macbeth straight from the off. Macbeth begins with Macbeth and Lady Macbeth suffering a tragic loss, and this loss never leaves them. No matter what they achieve, they are always looking back upon this loss and it devours them. That this scene is not in the original script that Shakespeare wrote should not be of concern, even to play purists. In the play, this tragedy for Macbeth and Lady Macbeth is mentioned, so it is part of the story. But by showing the event and making it the opening scene of the film, Kurzel gives the event a gravitas that is lacking in the original play. 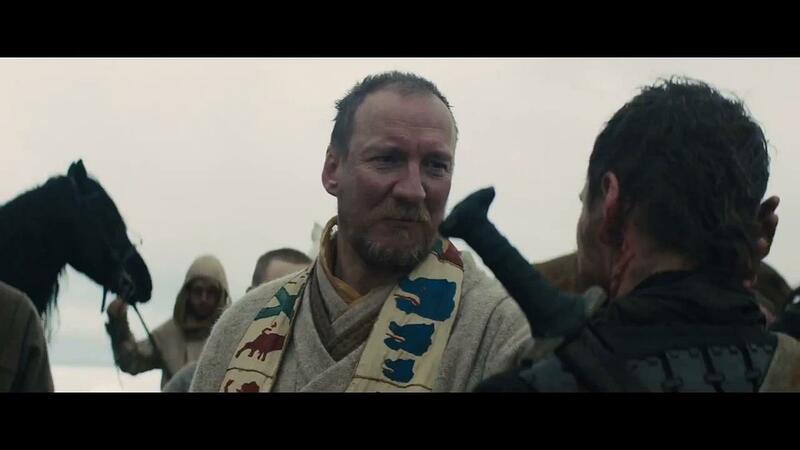 Macbeth greeting Duncan (David Thewlis) upon the latter’s arrival at Cawdor. This alteration from the source material is not the only instance in which Kurzel plays fast and loose with Shakespeare’s version of the story. Nonetheless, for play purists to put too much stress on the alterations would be to miss what Kurzel keeps and enhances from the original play. What’s more, unlike other adaptations which have given Macbeth a more modern slant (for example, the 2013 London theatre production starring James McAvoy as the titular character), Kurzel has made his 2015 film adaptation more medieval. 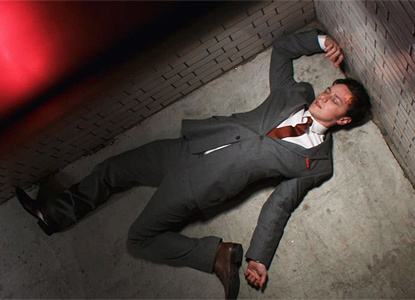 Consequently, the movie is bloody, grisly and muddy; all of which is fitting for the story. In addition, with the Scottish Highlands for the main setting, Kurzel has increased the authenticity of the play. The landscapes are apt and wondrous (perhaps even worth fighting for). Yet, the weather is grim, windy and rainy. These conditions breed miserable, nasty people who are devoid of humour. Indeed, the entire movie is devoid of humour and somehow that feels right. Indeed, Kurzel gets much right. However, his version of Macbeth is not without its flaws: the movie should have been longer than 113-minutes, and some key scenes are missing; the first twenty minutes are heavily edited, to point that one could easily believe that Kurzel has ADD; the battles are underwhelming, difficult to see, and rely too much on (300-style) slow-motion followed by super-fast, killer moves; and the final scene is jarringly out of sync with medieval times. Lady Macbeth (Marion Cotillard) trying to soothe her now kingly husband at Bamburgh Castle. 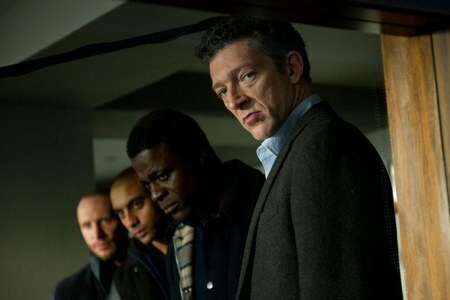 Nevertheless, even in the scenes where Kurzel does not get everything right, one can still be overcome by the music. The score has been written by Justin’s brother, Jed, and it resonates deeply with audiences. The music enables one to feel Macbeth’s and Lady Macbeth’s triumphs. Yet, in the same beat, it also enables one to feel as if the couple are looking back longingly at the loss that they cannot get over. Over-all, Macbeth is a really impressive film. The movie is not without its problems as it should have been longer, while the first twenty minutes and the last scenes should have been handled better. 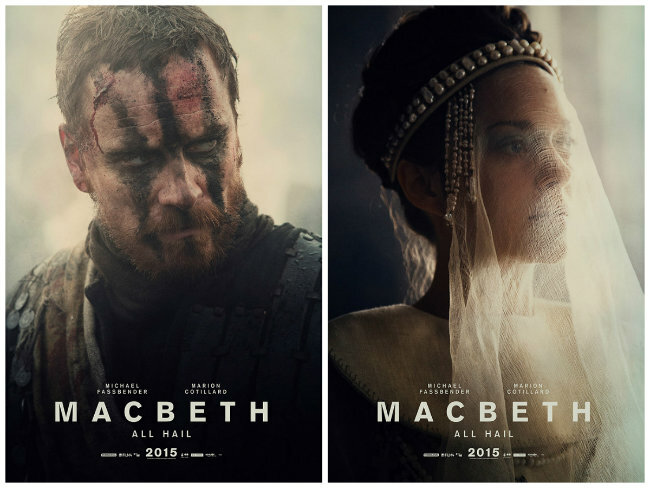 All the same, there is much to admire about Kurzel’s Macbeth from its gritty realism of Scotland in the late-medieval period, to the alterations that Kurzel has made from the original source material, to the astonishing performances of Michael Fassbender and Marion Cotillard. 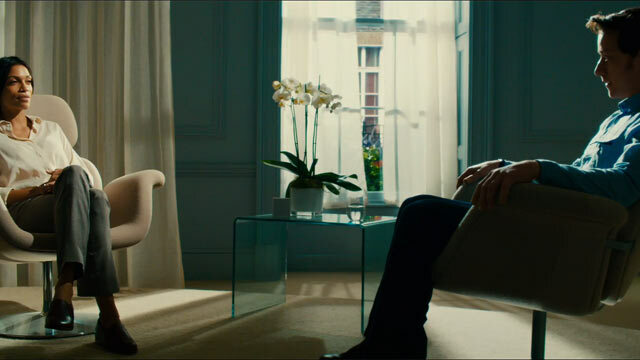 Undoubtedly, Fassbender and Cotillard make up the best elements of the film. They depict the strength and ambition of the two characters, as well as their tragic natures. They do this by presenting what can happen to us if we look back longingly for something we’ve lost. Fassbender and Cotillard show us that this loss will eat away at us and undermine everything we achieve, even if we achieve all that we desire and more.